UPDATE: A rep for Amazon tells Consumerist that while the new service was only available in the 10001 Manhattan ZIP code when it launched this morning (and of this writing), the company is adding other areas of the city throughout the day. Here’s a hypothetical: You wake up one morning to find that you’ve run out of toothpaste, what do you do? Sure, you could walk the two blocks to the local drug store and pick up a box. Or if you’re an Amazon Prime member you could just sit on the couch and wait an hour for some paste to be delivered, that is, as long as you live in a small section of Manhattan and feel like paying a shipping cost double that of the toothpaste. Amazon announced Thursday that it launched a new service, Prime Now, aimed at delivering tens of thousands of daily essentials to Prime members in as little as one hour; two hours if you want free delivery. Officials with Amazon say the latest “perk” for Prime members is available from 6 a.m. to midnight seven days a week. 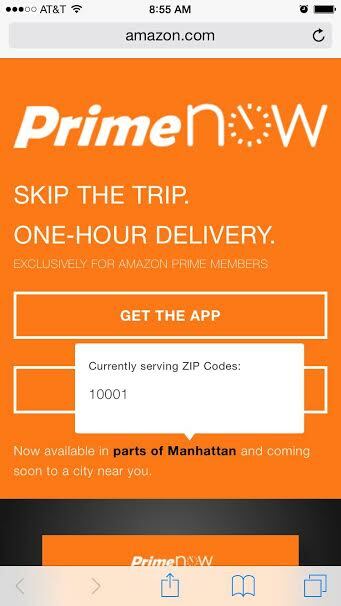 To access the service customers must first download the Prime Now app. After selecting the daily essential you’re currently lacking – anything from batteries to toys and books – the nearest Amazon fulfillment center will dispatch you order. While the service might seem perfect for those times you just can’t bear to leave the apartment without washing your hair (because you’ve run out of shampoo), there are several rather glaring drawbacks to Prime Now. For starters, the service is currently only available in select areas of Manhattan. And by that we mean, it seems like only ZIP code. While Amazon has yet to return Consumerist’s request to define what “select areas” means, the sleuths in our NYC bureau played around with the app and found that only one Manhattan ZIP code appears to offer the service: 10001. 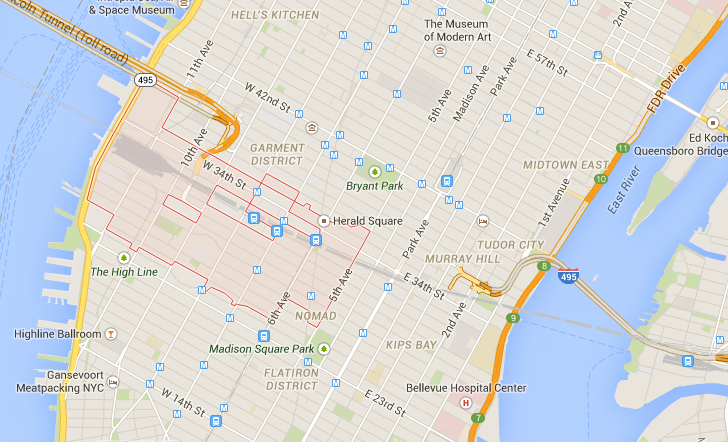 Here’s a Google map showing the current delivery area for Prime Now service. When we tried searching the app with an address just 10 blocks north of that 10001 zone, Prime Now shot us down. The same story went for addresses in two other Manhattan zip codes, both south of Central Park. Amazon says in its announcement about the service that users who download the mobile app will be notified when delivery is available in their area. But at this point it’s unclear when expansions of the service will occur. The other major downside of the service is the relatively steep cost for one-hour delivery. Consumers who decide to use Prime Now for daily essentials will have to shell out $7.99 to receive their toothpaste in 60 minutes. However, if they’re willing to wait a little longer, two-hour delivery with the service is free. Add the expensive one-hour delivery cost to the $99-yearly subscription fee Prime members already pay and that tube of toothpaste is looking pretty expensive right about now.